Mendenhall Glacier at dusk, TJ and I were photographing the glacier. I heard there were bears in that area the past a few days. 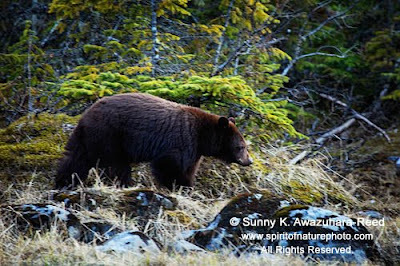 I was hoping to see a bear but I didn’t actually expect to see one since 2 coaches full of tourists just left. I turned back, there was a bear! A young black bear was 30 yards behind of me. He was playing with the flowers on the tree. 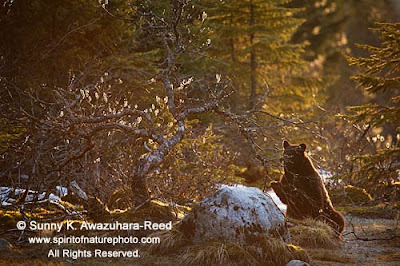 He stood up with his hind legs and eating the flowers for a while at warm sunset light. Then, he slowly walked away and left the bush. The presence of a bear made my day. 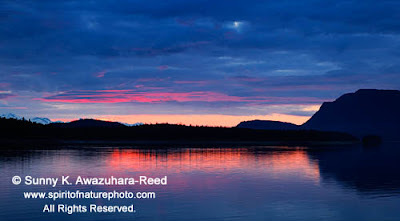 Again, Juneau is a famous for its rain… Fortunately, I had some opportunities to photograph sunset in Juneau while I was there. 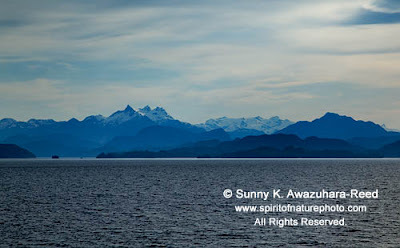 I love the scenery in Juneau where the mountains meet the ocean. 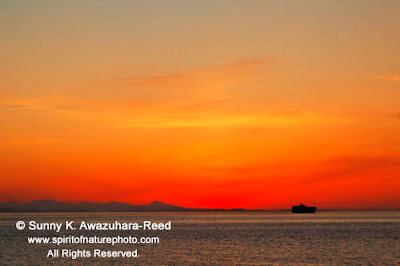 The 1st sunset was when it was a perfectly clear day… I was enjoying photographing all day outside. 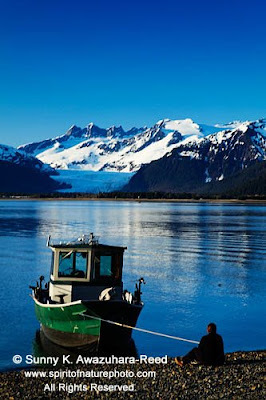 I was at Douglas Island and observed many fishing boats. After long sunny afternoon, the sun setting behind the small island in the channel was beautiful. A couple came back from kayaking at dusk. The 2nd sunset was spectacular! It was raining all day until the evening. I was still heading to the location and hoping to see the sunset. A little sun light came through a hole in the heavy cloud. 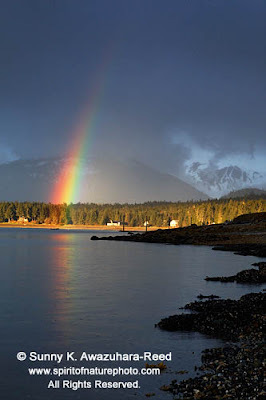 Then, a rainbow showed up! The sky got dark again, and it was raining when I arrived at the location. A few beams came from the holes, and spot lights lit the channel. The only a small part of the heavy clouds turned to a rose color. Then reddish sun rays lit up the ocean. It was an unexpected nature show after a long rainy day. The 3rd sunset was also after a long cloudy day. 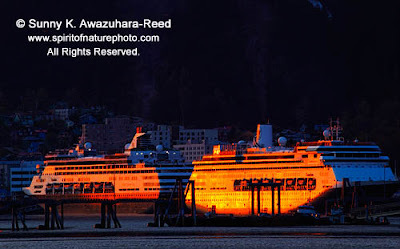 The 4th, last sunset was at another clear day in Juneau… the sun was setting behind downtown Juneau. 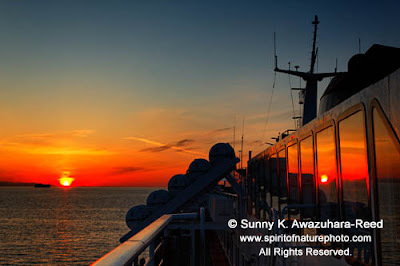 The bright orange light lit the cruise ships, and painted the channel as a sunset color. 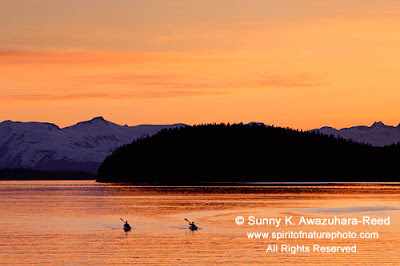 Fortunately, I had 2 perfectly clear days during the 7 days I spent in Juneau. 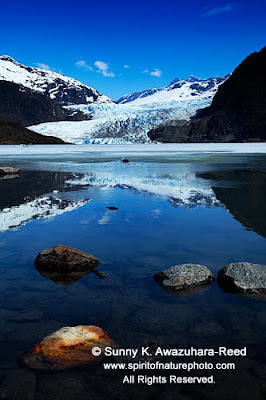 Mendenhall Glacier is located only 20 minutes from downtown Juneau and is one of the most visited glaciers in Alaska. 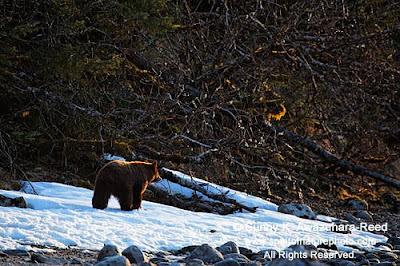 It is still spring in Juneau. 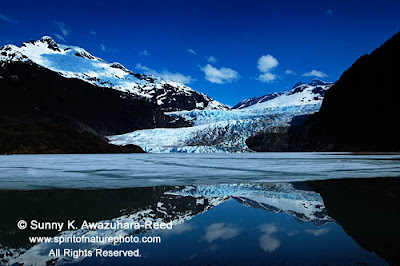 The glacial lake surrounded Mendenhall Glacier reflecting the glacier like a mirror, but is slowly melting during the spring thaw. 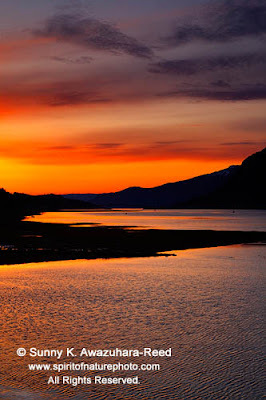 That afternoon, I was at Douglas Island, located across the Gastineau Channel from downtown Juneau. Mendenhall Glacier was right above the ocean! It was a stunning view. On the afternoon of May 1, Bellingham, Washington it was a beautiful clear day. I was getting on the ferry to Juneau, Alaska. 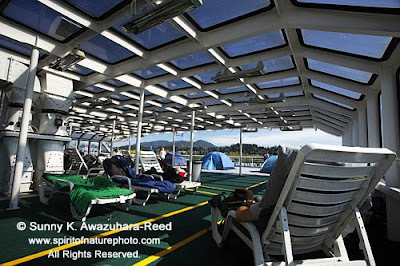 My “home” for 3 nights is a little corner on the deck, nicely covered by the glass ceiling and windows. I hauled a huge duffle bag and an equally heavy weighted small suitcase filled with photography gear, plus a heavy camera backpack. I set up my sleeping bag on a deck chair by the window. 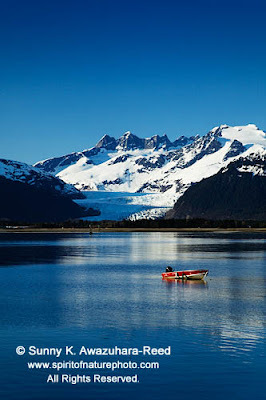 That’s the best view for Alaska’s Inside Passage. 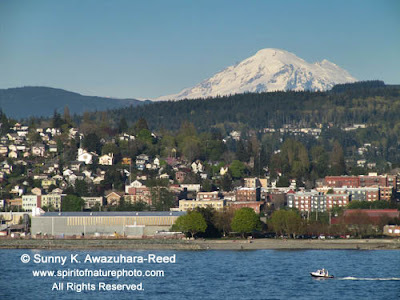 Soon after the ferry departed Bellingham, the snow capped Mt. Baker showed up behind the town to see us off. The water was very calm. The ferry barely shook. 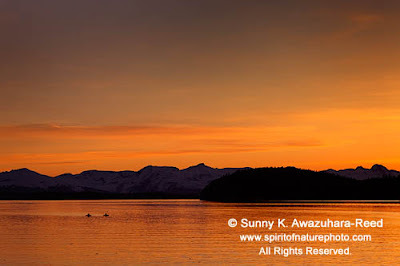 The day light was already long at the north… the sunset was after 8pm! 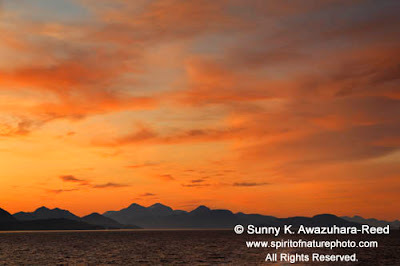 The northwest sky turned to vivid orange, and sun was slowly setting into the ocean. Another ferry was almost heading to the setting sun. I was holding my camera facing to the blowing wind. 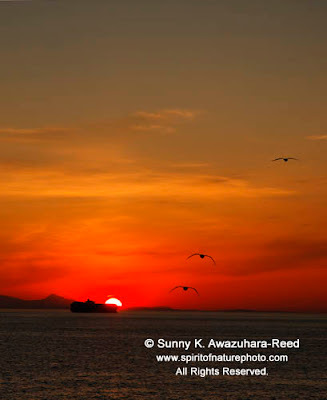 Seagulls flew across the ocean when the sunset. Nest morning, I was awakening by bright orange light… It was 5:30 in the morning. The first light painted the eastern sky. I jumped out my sleeping bag and grabbed my camera. I barely made it before fading out. 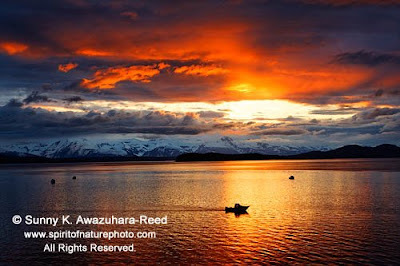 However, soon after sunrise, the sun hid under the heavy clouds. It was overcast throughout the day and raining the following day. 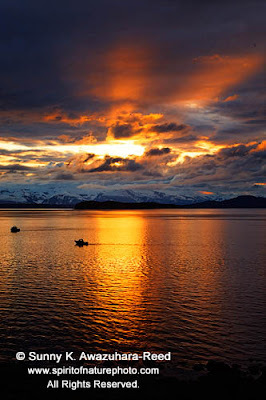 The ferry was slowly cruising via the Canadian Coast, and stopped in Ketchikan, Wrangell, Petersburg, and then finally arrived to Juneau on May 4.